One of the ironies I’ve learned through years of dissecting the habits and practices of top traders like Livermore is that there is nothing special to what they do. I’m not implying that what they’re able to do isn’t impressive; of course it is. I simply mean that they have no special or secret knowledge or ability that’s unique to them. Most people start out in this game looking for that “thing”; whether it be a special insight or indicator or strategy or whatever, that will show them how to win. They think if they can just find the secrets to what make the greats great, then they’ll be set. But in reality… if there’s any secret at all, it’s that there is no secret. Does that mean you can read Reminiscences… and instantly become a great trader? Well, let me ask you this: can you read the classic Ben Hogan’s Five Lessons on golf and go out and play scratch golf? Of course not! And that’s because both books have all the foundational knowledge you need to succeed but they don’t supply the practice that ingrains the lessons and transforms that knowledge into wisdom. The practice is the hard part. It takes time and a Herculean effort. Blisters and portfolio losses. There are no short-cuts. But practice without knowledge is wasted effort. It’s like trying to run on your hands because nobody ever told you to use your feet. So with that, here’s the knowledge (with some commentary by me), as given by Livermore many years ago. What you do with it is up to you but I suggest you try running with your feet. Losing money is the least of my troubles. A loss never bothers me after I take it. I forget it overnight. But being wrong — not taking the loss — that is what does damage to the pocketbook and to the soul. Of all speculative blunders there are few worse than trying to average a losing game. My cotton deal proved it to the hilt a little later. Always sell what shows you a loss and keep what shows you a profit. That was so obviously the wise thing to do and was so well known to me that even now I marvel at myself for doing the reverse. 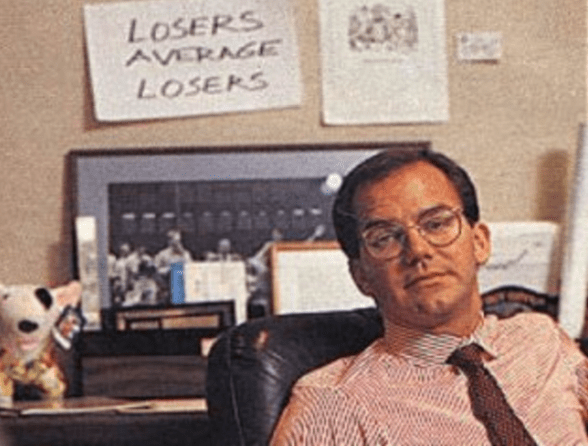 This lesson was important enough that Paul Tudor Jones had it plastered on the wall right above his desk. I still had much to learn but I knew what to do. No more floundering, no more half-right methods. Tape reading was an important part of the game; so was beginning at the right time; so was sticking to your position. But my greatest discovery was that a man must study general conditions, to size them so as to be able to anticipate probabilities. I think it was a long step forward in my trading education when I realized at last that when old Mr. Partridge kept on telling the other customers, ‘Well, you know this is a bull market!’ he really meant to tell them that the big money was not in the individual fluctuations but in the main movements — that is, not in reading the tape but in sizing up the entire market and its trend. Disregarding the big swing and trying to jump in and out was fatal to me. Nobody can catch all the fluctuations. In a bull market your game is to buy and hold until you believe that the bull market is near its end. To do this you must study general conditions and not tips or special factors affecting individual stocks. I cleared about three million dollars in 1916 by being bullish as long as the bull market lasted and then by being bearish when the bear market started. As I said before, a man does not have to marry one side of the market till death do them part. But I can tell you after the market began to go my way I felt for the first time in my life that I had allies — the strongest and truest in the world: underlying conditions. They were helping me with all their might. Perhaps they were a trifle slow at times in bringing up the reserves, but they were dependable, provided I did not get too impatient. Livermore understood man’s foibles perhaps better than most. He made and lost multiple fortunes, the size of which, most could hardly fathom. He knew well the fundamental truth that becoming a great trader is as much about self-mastery as it is about market mastery. There is what I call the behavior of a stock, actions that enable you to judge whether or not it is going to proceed in accordance with the precedents that your observation has noted. If a stock doesn’t act right don’t touch it; because, being unable to tell precisely what is wrong, you cannot tell which way it is going. No diagnosis, no prognosis. No prognosis, no profit. And right here let me say one thing: After spending many years in Wall Street and after making and losing millions of dollars I want to tell you this: It never was my thinking that made the big money for me. It was always my sitting. Got that? My sitting tight! Cut your losses: Never average down and never hope losses reverse. Just cut. Infinite patience: Good trades are few and far between. Trade for profits, not for action. Learn macro: Understanding general conditions is essential to being a market master and not a piker. Price action is king: Learn to read the tape and don’t argue with markets — they know more than you. Big bet/sit tight: Ride your winners for all their worth. This conviction comes with practice. Self-mastery: You are your greatest impediment to your own success. “Know thyself”.